Update: It seems there’s no way to edit the map directly via the link because Google’s Maps Engine Lite, which is still in beta, may have some issues to be worked out. So to add your marker to the map, you can either email me at abialick@streetsblog.org and I’ll add it for you, or you can add it yourself (if you have a Google account) by first clicking here, then here. The map should open with some editing tools at the top. Click the marker icon labeled “Add marker,” next to the hand icon, and place your sighting. SFist started a crowdsourced map of sidewalk biking last week, calling it “a real problem in this city, annoying probably dozens of people a day.” No argument there — I’ve been known to call out offenders myself, though fortunately, injuries like the one on Market Street this month (which seemingly prompted SFist to launch the map) seem to be pretty rare. While we’re at it, though, let’s build a map of the far more rampant offense endangering people on San Francisco’s walkways — sidewalk parking. 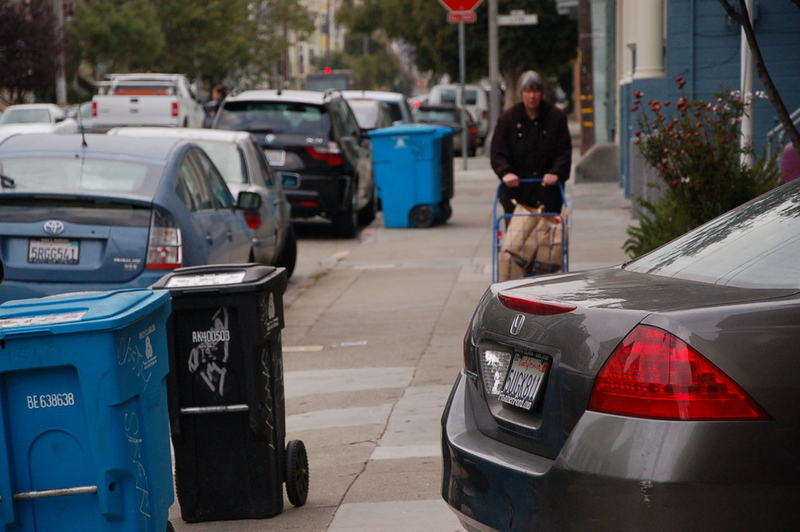 The problem is most widespread in neighborhoods like mine, the Inner Sunset, where many drivers seem to interpret the ubiquitous curb ramps, garages, and “setbacks” in front of houses as an invitation. I’ve started the map off by adding two car-blocked sidewalks I spotted just while making my way home yesterday. Even though the vast majority of the city’s street space (plus garages and parking lots) is carved out primarily for automobile movement and storage, many drivers just can’t seem to help but leave their property on the small portion of space reserved for walking, resting, and social activity. It often creates dangers for seniors, people who are visually impaired or using wheelchairs, and those using strollers, since a barricaded sidewalk means people are forced to enter the roadway or step on a sloped curb ramp to get around. Yet despite popular misconceptions — even among parking enforcement officers, as I’ve heard — it’s almost always illegal to park on any part of a sidewalk, driveway, or setback (the area in front of a building not deemed to be the sidewalk). Sidewalk parking is explicitly prohibited in the California Vehicle Code, and the San Francisco Planning Code (Article 1.2, sec 136) states that “in no case shall parking be allowed in [required] setbacks.” Aside from the hazard, unsightliness, and general degradation it brings to the pedestrian environment, there’s good reason parking shouldn’t be allowed even behind the “property line” — it amounts to an illegal increase in the number of off-street parking spaces allowed under zoning controls. In some neighborhoods, car owners have been known to use threats of violence to intimidate enforcement officers from citing sidewalk parking offenders. When it comes to the folks they’re forcing to squeeze around their personal property, however, these drivers can enjoy the privilege of not having to actually show their face and own up to their rude behavior. This is actually a map of evictions I borrowed from ##http://www.sfbg.com/politics/2013/04/30/you-want-scary-weve-got-eviction-map##the Bay Guardian## for the sake of convenience. Well said, not to mention more driving slows down MUNI. Unfortunately, the City induces many car trips by giving the wink and the nod to illegal parking, like on the sidewalk, but also all over streets and bike lanes on Sundays. Dolores’ traffic lanes and medians are absolutely littered with illegally-parked cars every Sunday, those hundreds of people encouraged to drive by the City with the promise of free, illegal parking. Call SFMTA to complain and they will freely admit that they will not cite if there is a church nearby. The New York Times even wrote an article about it (http://www.nytimes.com/2010/06/04/us/04bcjames.html), how it’s dangerous for bicyclists, runs afoul of the Transit-First policy, separation of church and state, etc. If the City wanted to reduce congestion, air and noise pollution, and crashes, while increasing pedestrian and bicycle safety and speeding MUNI, all it would have to do is enforce existing laws. But that’s apparently not what the City wants. Could we add cars double parking in bike lanes? I swear the real purpose of “bike lanes” in SF is to surreptitiously double the amount of parking for motor vehicles. Accessible from computer or phone, comment, add pictures, etc. I just self-reported to the SFist twitter feed. I rode my bike on the sidewalk for 15 feet cause I needed to tie my shoe.